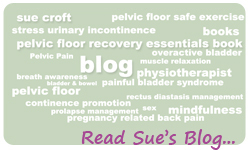 Sue has a total of 5 physiotherapists working at her practice including herself. All the physiotherapists are experienced Pelvic Health physiotherapists, having undertaken many courses and post-graduate study related to managing complex pelvic health conditions such as: pessary fitting, persistent pelvic pain, management of all types of urinary incontinence, prolapse assessment and treatment, bowel dysfunction treatment including constipation, faecal incontinence (soiling) and incomplete evacuation. Sue has trained Jane, Megan, Alexandra and Martine to assess and provide education and treatment in the same manner as Sue does. There is no advantage in waiting a prolonged time to see Sue as all the other physiotherapists are able to treat your condition much more quickly and before it may develop into a more major problem. If there are any concerns regarding a particular problem all our physios readily consult with Sue to ensure appropriate treatment is provided for you. To make an appointment, ring (07) 3848 9601 between 7.30am and 3 pm Monday to Friday or text 0407 659 357 anytime. Appointments are available Monday to Friday. Some later afternoon appointments are now available on Mondays with Martine and Tuesdays with Alexandra. The initial pelvic floor consultation takes approximately one to 1.5 hours depending on the nature of your condition. The follow-up consultation, one month after, usually takes 30-45 minutes. If all is going well then we arrange a third half hour appointment after a further three months. Sue encourages you to make regular yearly appointments to review how your condition is going and to ensure life-time management of your condition. The appointment time required for chronic pain patients is often up to an hour and a half (and as such may cost slightly more) and there may be more regular appointments depending on how the pain condition is resolving. Children are usually seen at one month intervals until the problem is sorted. To provide more time for education and treatment at the initial consultation, Sue (only) will most often call you prior to the first appointment to do some questions over the phone. Jane, Martine, Megan and Alex will conduct the assessment at the first meeting at the rooms and have longer time to do this. The initial consultation involves extensive education regarding the bladder, bowel and pelvic floor. An internal examination of (only for adult patients who provide informed consent) is offered to give the patient feedback on the condition of their pelvic floor muscles. A home program is given to the patient and an extensive information booklet provided to take away. A copy of Sue’s book, an extensive handout for revision and a special measuring container (for measuring your bladder capacity to do a bladder diary) will also be included in the initial consultation. A re-assessment and review of symptoms will occur at the follow-up appointments. Jane, Martine, Megan and Alex also have a musculo-skeletal background which means they can treat orthopaedic conditions, joint and muscle pain for all parts of the body. (Sue does not treat musculo-skeletal conditions, so always book with one of the other physios if that is your primary concern). These initial appointments will be approximately one hour and you will be given a home programme to continue at home. The frequency of follow-up appointments will be usually more frequent. Alexandra has undertaken and recently completed her Post Graduate Continence and Women’s Health Certificate at Melbourne University and is also trained in lymphodaema management and will be able to assess and treat you if you have this condition. Alexandra and Megan assess and treat patients with Men’s health problems also (pre/post-prostatectomy assessement and treatment, persistent pelvic pain such as chronic prostatitis, erectile dysfunction, bowel disorders and urinary incontinence, coccydynia). 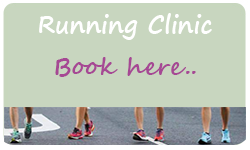 Jane is also a certified running coach and conducts Running Clinics at Sue Croft Physiotherapy. Megan and Martine can also do running assessments. Running assessments can be booked online or by ringing the rooms. Martine conducts one-on-one breath awareness and relaxation classes which are very beneficial prior to the birth of your baby if you are pregnant or if you have persistent pelvic pain. We will also conduct a group pain relaxation class at the rooms (as we used to conduct at my exercise studio). Remember all of the physiotherapists at Sue Croft Physiotherapy will be assessing each patient’s problems and covering the educational content in the same manner that Sue does and they are able to see patients sooner due to Sue’s busier workload and unavailability due to attendance at conferences and time spent writing. Hicaps facilities for most Private Health Funds are available. The amount you receive back varies depending on your individual health fund. Ring your health fund and check what your rebate will be as each fund varies. The Health Insurance card is swiped through and then the balance is paid via cash, credit card or EFTPOS. There is often a significant gap for the initial consultation as this initial appointment is longer and complex. Visa / MasterCard / American Express/ EFTPOS facilities are available with no surcharge for paying the balance of the consultation on credit card. Sue and her physios are registered with Medicare for the Enhanced Primary Care Plan. If your GP has decided that you are eligible for a plan, the GP will fill out the necessary paperwork and you will need to bring this referral with you, as well as your Medicare card and an EFTPOS card as the claim can be processed at the rooms. This appointment is not bulk-billed – there is a significant gap with the plan, unless you have reached your Medicare Safety Net, in which case Medicare will work out the rebate (often a percentage) and this means the rebate is significantly higher.